It never ceased to amaze me how abruptly summer vacation came to an end as a kid. The magical, care-free days of summer seemed to cease overnight, without the slightest warning of abandonment. It was always a depressing time for me, knowing that there would be no more trips to the beaches of Florida or endless afternoons spent watching Nickelodeon. But, the end of summer did mean one good thing: new school supplies. For the strangest reason, that annual trip to K-Mart for new supplies filled my little heart with such content. Looking back on it, I wonder why I ever felt that way about notebooks and erasers, but I'm glad to now see that I wasn't the only one who gets excited over new pencils. Korean students are obsessed with school supplies and considering the average high school student studies for an average of 16 hours a day, I'm guessing they go through a lot of them. Even in the smallest of neighborhoods, there is always at least one stationary shop that sells colorful and cute supplies from the early mornings to late at night. Said stationary and supplies aren't exactly what I used growing up in the States and I was surprised by the differences as soon as I started teaching in Korea. 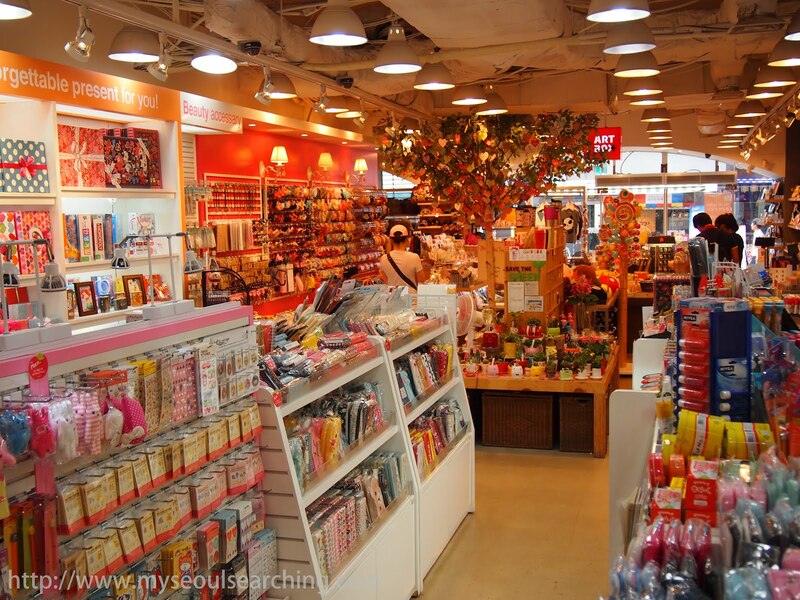 Artbox, a famous stationary franchise, can be found throughout the country and has a large stock of adorable school supplies. One of the first things I noticed was that pencils don't usually have built-in erasers. Perhaps the lack of eraser is related to the cultural demand for perfection and silently commands that the holder make no mistakes. Or pencil manufacturers have some deal with eraser producers to keep business separate. Who knows? Recently, my mom sent a pack of eraser toppers to distribute to my students after noticing this difference at my school when she visited back in May. The kids were obsessed and thought they were the best things ever. Considering the number of items the stationary shops do sell, I'm surprised these aren't included in the stock. 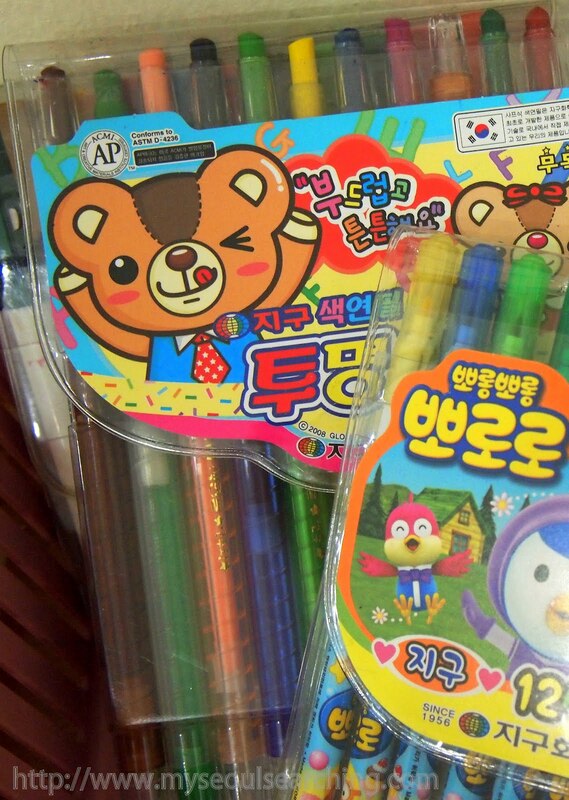 Perhaps one of the most shocking differences is how Koreans sharpen their pencils. Sure, there are manual pencil sharpeners which require a lot of pulling, squeezing, and twisting parts to get the job done, but many students carry around a razor blade primarily for the purpose of creating the perfect pencil point. I almost had a heart attack when one of my first graders pulled a blade out of her backpack last year. Knowing one could be arrested for such an offense in some American schools, I immediately brought her to the office. It was only when my supervisor gave me a "Yes, what's wrong with a six-year-old having a razor blade at school?" look did I realize that it was the norm. Korean manual pencil sharpeners require a lot of work, but aren't as dangerous as razor blades. Some Crayola products like crayons and fat markers are for sale in Korea but are generally quite expensive and not at all similar to the coloring alternatives that have been used for decades amongst students. Instead, kids use what they refer to as "color pencils" which are actually colored wax sticks that come in twistable plastic 'pencil' casings. They also use "sign pens," felt-tipped skinny markers. There isn't a lot of variation in either of these two products and kids wouldn't dream of going to school without them. Another necessity is glue, something that is not really used in semi-liquid or paste forms. Glue sticks are the way to go for Korean kiddos. Color pencils aren't exactly pencils or crayons but are the preferred item amongst school-aged kids. Like everything else in Korea, school supplies are adorable and the more colors and characters one has on his or her notebooks, the cooler he or she is, at least in the world of elementary school students. Of all stationary items, pencil cases have to take the cake when it comes to cuteness. I've seen some incredibly creative designs from bags that look like Converse high top sneakers to boxes that have about 100 different compartments. Students tote their pencil cases, which are generally smaller that those used in America, everywhere and tend to stay trendy by purchasing a new one every few months. Something that isn't exactly a supply, per say, but is found in many Korean classrooms is flag blocks. On each block is a flag and the name of its respective country, written in both English and Korean. Korean kids are shockingly good at knowing the flags of countries, many of which I didn't even know existed. One of these days, I'm going to get a video of my kindergarteners reciting them and shock the rest of the world. Finally, no Korean student above the age of kindergarten leaves the house without their nametag, which is often sewn on or pinned to the breast of their uniforms required by all Korean schools. It is believed that these nametags instill a sense of accountability in the students and subsequentally keep them out of trouble. Not a bad idea if you ask me. Typical nametags that all students wear are sewn or pinned to their uniforms. Ancient Korean scholars used to call brush, ink, paper and inkstone the "the four friends of the study," essential items to cultivate the mind. I guess in some ways, things haven't changed. Sure, Hello Kitty might be plastered across the paper and the ink might be sparkly and purple, but school supplies continue to develop students in the area that Korea values most: education. BONUS PICTURE TIME! 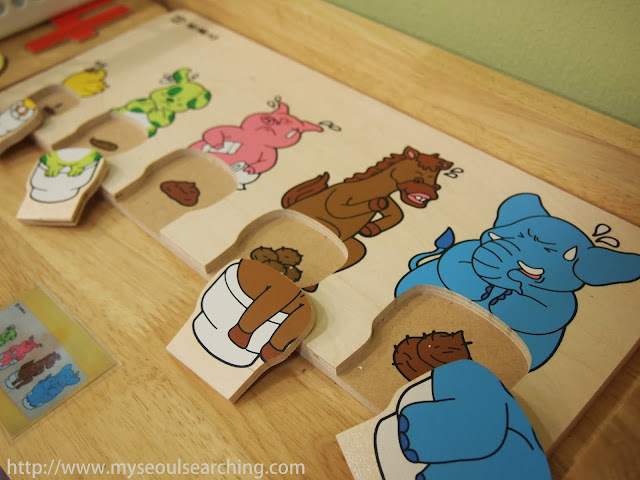 I found this awkward match-the-straining-animal-to-its-poop-in-the-toilet puzzle in one of my school's Pre-K classrooms a few weeks ago and just had to share in this somewhat related post. The knife thing is something I will NEVER get used to. I find myself saying, "Please put the knife away" at least once a day. So strange. Also, kids here are obsessed with the brand of mechanical pencils and seeing who has the most expensive one. They always ask me about them and I have no idea what they're talking about! Couldn't agree more about the mechanical pencils ("sharps"), Amanda! Another thing that gets me is preschoolers with adult scissors. Come on! Thanks for checking out my blog... I'm an avid reader of yours!